Welcome to the official website of the Georgia Division Reenactors Association! If you have an interest in our American History during the period of 1861-1865, we invite you to join our ranks. 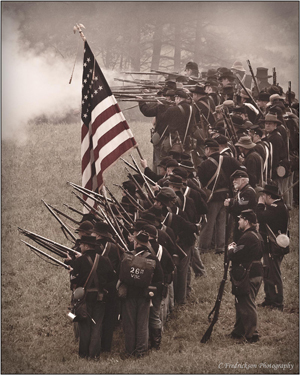 Experience being part of bringing our nation's most turbulent and tragic era to life. You will meet and enjoy interesting and diverse people from all walks of life as you become part of one of the most rewarding and fastest growing hobbies in America. 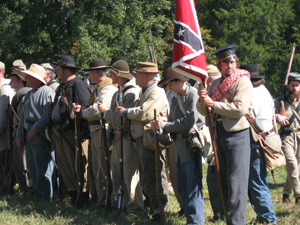 The Georgia Division Reenactors Association, Inc. (GDRA) was founded in 1978 and has become Georgia's premier professional Civil War reenacting organization. The GDRA is both non-profit and family-oriented. 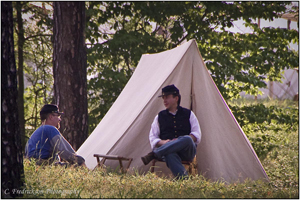 We honor the brave and resourceful people from our past by participating in living history demonstrations, battle reenactments and memorial services. Our membership is open to all who strive to accurately portray either military or civilian impressions of life during this period. We make every effort to continue to educate both ourselves and the public about the realities of the era. The GDRA supports and participates in raising funds for historic preservation of Civil War sites in Georgia and throughout our nation. Since the Battle of Resaca reenactment's inception in 1983, the GDRA has organized and hosted this event on the third weekend of May. We regularly attend other events in Georgia and around the nation. Each of the GDRA branches reflects the highest standards of historical authenticity in dress, conduct, equipment, weapons, grooming and safety for its members. Based on these standards, our Division has earned the respect of various National and State parks and historic sites. 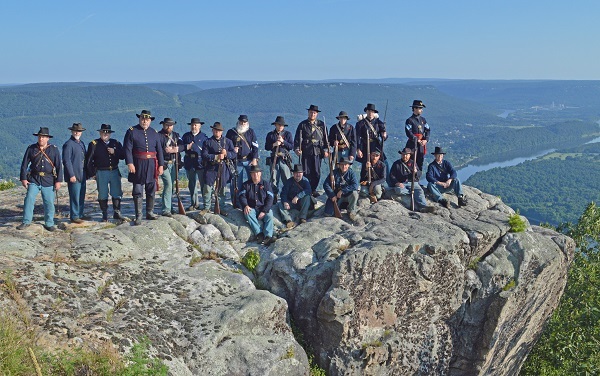 The GDRA Infantry and Artillery on Lookout Mountain in Chattanooga, Tennessee. The GDRA is under the command of the Commanding General. Other staff members include a Chief of Staff, Secretary and Treasurer. The Division is governed by a Board of Directors comprised of the Ordnance/Safety Officer, AIG, Judge Advocate, Immediate Past Commanding General, and two representatives from each branch. Presently and into the new millennium, the GDRA will continue to make changes to reinforce our commitment to the continued growth of the Division and of the hobby. We are becoming more pro-active in recruitment, in preservation efforts and in adaptation to the changing trends and directions of reenacting. Our Division wishes to foster a renewed sense of brotherhood and cooperation among reenactors from Georgia and the Western Theater of Operations, thereby establishing strength and unity. Whether you are a new recruit or a seasoned veteran, a living historian, or a unit looking for a home, the GDRA has a home for you. We have branches for both military and civilian reenactors. Our military branches also galvanize to do Federal impressions as needed at certain events to help provide accurate portrayal of troop ratios. 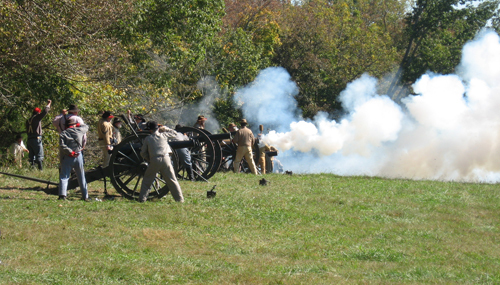 The GDRA Artillery at a recent Battle of Fort Sanders Reenactment near Knoxville, Tennessee. So, if you want to hear the thunder of musket and cannon, smell the smoke of battle, relive camp life, experience civilian life, and honor the life of your ancestors, we welcome and await you! We are looking for fifers, drummers, and buglers to join our ranks as field musicians. The pay isn't much, but the rewards are great. All levels of experience are welcome. Click the following link for more information and to see The Top 10 Reasons to be a Field Musician! Each year on the third weekend in May, the GDRA and the Battle of Resaca, Inc., host the annual Battle of Resaca reenactment. The event takes place on over 650 acres of the original battlefield and includes a battle on both Saturday and Sunday. Proceeds from the event go towards battlefield preservation. Click here to find out more. For more information about becoming a part of the Georgia Division Reenactors Association, please contact our Division Commander on our Contact Us page. Select photographs on this website courtesy of C. Fredrickson Photography. This website last modified on March 30, 2019.